Piecing together clues about a "mysterious" week-long trade show at the Bill Graham Civic Auditorium in San Francisco, a report on Monday suggests Apple might have rented out the massive space for its annual iPhone event. While local publication Hoodline was unable find any hard evidence leading back to Apple, and could only confirm with staff on the ground that preparations were being made for a "private event," digging through San Francisco Planning Office documents did yield a few tantalizing clues that seemingly jibe with an upcoming iPhone announcement. For example, the venue is being rented out from Sept. 4 through Sept. 13, ample time for Apple to make indoor and outdoor building preparations like installing product banners, demo tables, AV system improvements and more. 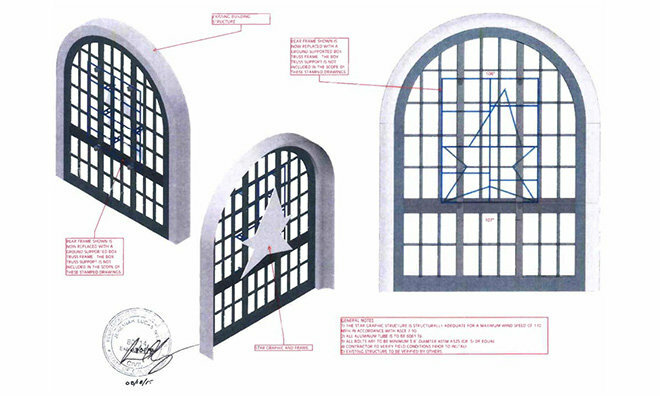 In addition, documents show plans to replace or modify four building windows facing Grove Street with 15-foot logos shaped in what appears to be a warped star. Looking at mock-up drawings, an Apple logo would indeed fit well over a subframe shaped to support a five-pointed star. As noted by the publication, the event's dates conflict with the Labor Day weekend, an unusual choice for a trade show. Whatever the case, logistical concessions for a large gathering are already underway, with power generators taking up a lane of parking spaces. SFPD and private security guards are also stationed outside the auditorium. The Bill Graham Civic Auditorium can hold 7,000 people, much more than Apple's most recent venue selections at Yerba Buena Center and Flint Center, which seat a respective 1,470 and 2,400 people. Apple traditionally unveils its annual iPhone refresh in early September, a date quickly approaching. Last year, for example, the company sent out invitations for a Sept. 9 iPhone 6 debut on Aug. 28. Held at Cupertino's Flint Center, the 2014 event was jam-packed with new product announcements, including the unveiling of Apple Watch, for which Apple built a special building annex to host attending media. This year Apple is expected to debut next-generation 'iPhone 6s' and 'iPhone 6s Plus' handsets, while reports suggest new Apple TV hardware might also make an appearance.